This thesis was born out of a desire to study the character of the Catholic priest in literary works of fiction in order to learn new ways of understanding them and the God they serve in a rapidly changing world. Much has already been written about priests in the Western hemisphere in works such as Graham Greene's The Power and the Glory and Georges Bernanos The Diary of a Country Priest but much less is known of books about priests from other parts of the globe. Through a process of elimination, it was decided to consult the works of the revered Shusaku Endo because he is considered by many scholars to be Japan's, if not Asia's, foremost Catholic writer. In an attempt to reconcile his Catholic faith with his Japanese identity, Endo ultimately produced a series of fictional stories that provided a rare glimpse into the lives of Catholic priests in a non traditional Catholic setting. Four of Endo's novels were chosen for this study because of the prominent roles that the Catholic priests played in them: Volcano, Silence, The Samurai, and Deep River. 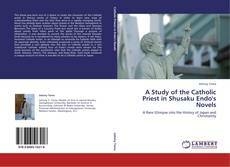 Each book rendered a unique account of what is was like to be a Cahtolic priest in Japan.